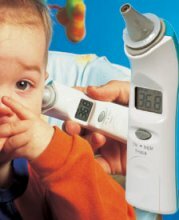 The TH809 Personal Ear Thermometer is designed to take the temperature of a person, whether they are a young child to an adult, without giving the patient pain or an unpleasant pressure sensation. To make the temperature easier to measure the medical thermometer’s head is angled to insert into the ear with little or no fuss. Product exactly as described - excellent quality and excellent service. very quick despatch,ideal product for what it is desighned for.very easy to use.at last get a accurate reading.do business again.